Apple's new iPad Pro has a hidden feature – it sticks to things! Apple’s new iPad Pro is considered by many as the best tablet out there thanks to its range of premium features and all-screen design. But one thing Apple isn’t advertising is the tablet’s ability to stick to things. Over the past 24 hours, a few reports have emerged online claiming that Apple’s new tablet sticks to things – literally. We saw this and thought “hey, why not give it a try?” So we did. And, guess what? It actually works. 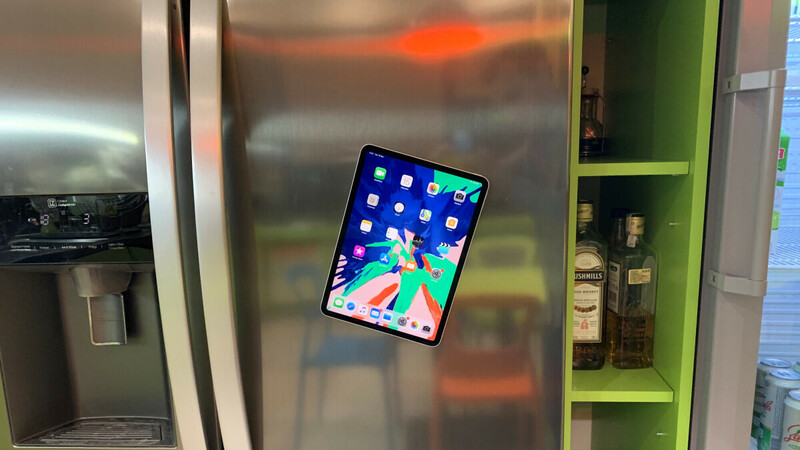 Through our own rigorous and extensive testing, we managed to stick the iPad Pro to basically anything that’s made out of metal – the refrigerator is our personal favorite. Still, beware that, if your tablet acts anything like our one, it may eventually slide down objects in a rather slow and comedic fashion until eventually hitting the floor. If you’re wondering how all of this is possible, it’s actually down to the magnets included inside the tablet. 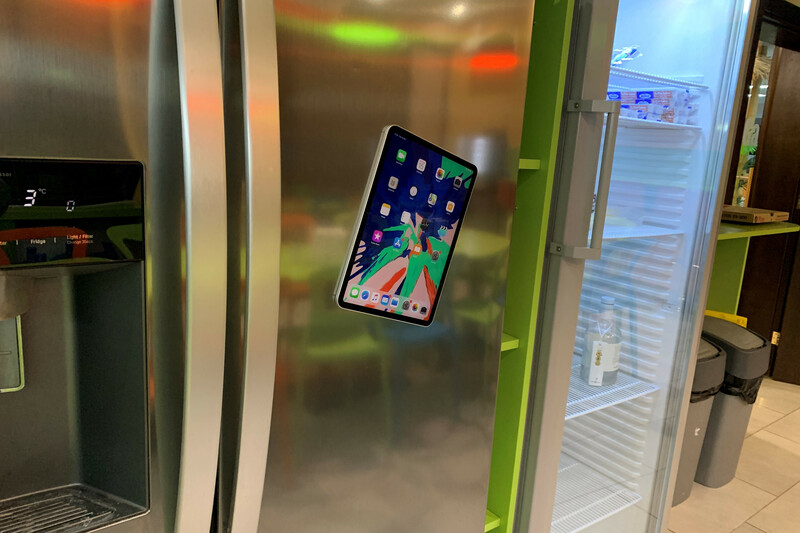 The Silicon Valley giant claims that these are designed to keep the Smart Folio Keyboard securely connected but, let’s be honest here, being able to stick your iPad Pro to the kitchen door or possibly turn the refrigerator into a smart fridge is much more fun. However, as there's a risk of damage, we, unfortunately, can't recommend this party trick. Nice.. If it drop, then it's an extra $599 for Apple.. If it goes viral, Apple will be really happy for their extra income. This new iPad has dozens of magents inside. Some are dedicated to stick folio case, some are for Apple Pencil and rest are for the 4 unusually big speakers. MKBHD showed it in his video with a paper that scans magentic field, there were dozens of magents visible. Well it does have magnetic properties though. There are several Apple fans here whom I figured their iPhones were very sticky. Never mind that , how about you tell us how apple stock ( that I'm sure phonearena owns) is going to hit 270 . Lol , I hope people listened to me when I told not to believe you cause apple stock was going to be selling at a discount. And more discounts to come in the stock market. They dont own any stock I'm Apple. I'm fact, as much cheerleading they do foe Apple, they claim doesnt send them review units. Strategic Developer is right. We get them ourselves – I personally picked up this year's iPhones, iPad Pro, and Apple Watch on launch day for our reviews. Yes I am surprised Apple dows send you any. Especially because you guys are ProApple and Anti-Samsung /s ;-) PhoneBuff the YouTuber you guys use to post showing drop tests, Apple stopped sending him review units because they felt he was giving Samsung ro much love. But hey he was trying to be a fair reviewer and it happens the Samsung product was just better. Apple didnt like it and cut him off and now he has to buy his own units. So they should be showing you live. They'll need to work harder, maybe as hard as BGR, 9to5Mac, or Cult of Mac.. This is a feature? Really? Is this wirth the $800-1800 its gonna cost you? Wow! Calling this a feature is showing just how low your expectations are on Apple products. Yes. The iPad offers the best tablet experience on the market by far. Besides this is something one could use for many years before getting a new one. It's a great gift for someone over the holidays. Last but not least, because it's not worth it to you, weather it's because you can't pay for it, or you don't have use to it, dosent mean it's not a fantastic device for someone else. Same goes for anything else. Only if you don't count the Surface Pro. "The iPad offers the best tablet experience on the market by far" I would disagree, it is a great piece of hardware and for basic consumer and maybe some niche "pro" uses. However, IOS does hinder the consumer experience for many and is not a "pro" operating system by a long way. I would strongly argue that the Surface tablet is a better overall tablet, especially for most "pro" users and many consumers too. If I could have an iPad with Windows 10 (ideally) or even Mac OS, I would agree with you. Your post is just stupid. He said the best "tablet" experience, nit hybrid or laptop experience. All other pure tablets run Android as far as I know. And none of them come even close to the latest iPad Pro in terms of anything. Stopwith your stupidity please. Is their an iFridge happening in Apple's product portfolio? LOL! Watch out LG and Samsung...LOL! Thank you. What an idiot. No, they're next product line will be the iCar. Their trying to compete with Tesla. But there going to fail. Nice! Their could be.a party, there suppose two go, but they're to drunk too make it.